Despite the chilly weather, beach season officially starts this week. 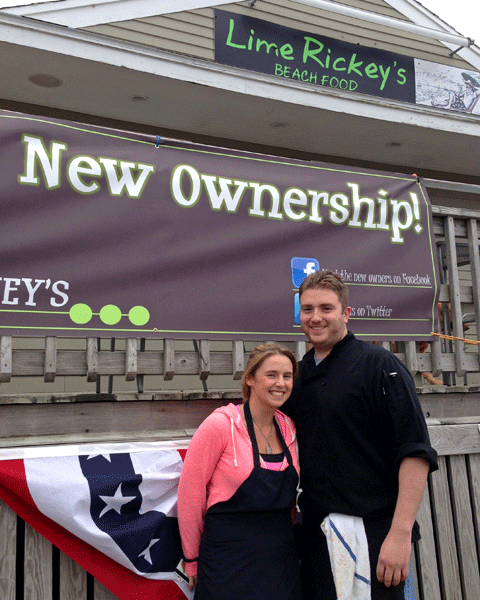 It came as a surprise to many at Marblehead’s Devereux Beach to see a banner adorning the seasonal food stand proclaiming new ownership. The stand, which had been run most recently by Paul Petersiel of Swampscott’s Red Rock Bistro (which also houses another Lime Rickey’s location) was sold last month to Anthony Marino and Victoria Farnsworth, owners of Beverly’s popular Marino’s Café. We were never particularly impressed with the old Lime Rickey’s, so were interested to hear of the change. We stopped by during their soft opening this afternoon to get the scoop on what beachgoers can expect this summer. The menu will stay true to classic New England beach shack cuisine, offering fried seafood, burgers and dogs, sandwiches, and Richardson’s ice cream. Keeping things hand made and local, says Farnsworth, will ensure fresh flavor and reasonable cost. The stand will steam lobsters fresh on-site, provided by lobsterman Jeff Bartlett out of Beverly, and the aim is to keep lobster and lobster roll prices as close to market value as possible. Other seafood will be provided by local company Patriot Seafood, who pick up at the dock in Marblehead. One welcome change that we noticed was the size of the burger. Several ounces have been added, but cost hasn’t. The perky Farnsworth shakes her head. “Four ounces just wasn’t big enough.” Topped with healthy slices of tomato, lettuce, and onion and accompanied by a side of tasty homemade potato chips, it’s a definite improvement. The portion size on the fish and chips wasn’t skimpy either. The light, crispy batter and hand-cut fries convinced us we’ll have to return to try the clams and shrimp. We felt bad firing questions at this enthusiastic young couple while they were working out the kinks on their first day, but they took it in stride. Our visit has us looking forward to simpler fare prepared more thoughtfully, better value, and the possibility of fun things like live music and weeknight lobster dinners. I wish them so much luck. I think if the prices are reasonable for beach goers & the quality is good, they should do well. 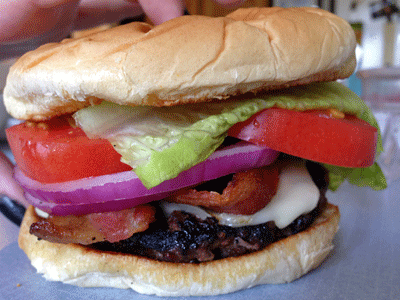 regarding the burger…bigger is not always better.. If it’s anything like Marinos in Beverly, then this play will be awesome.